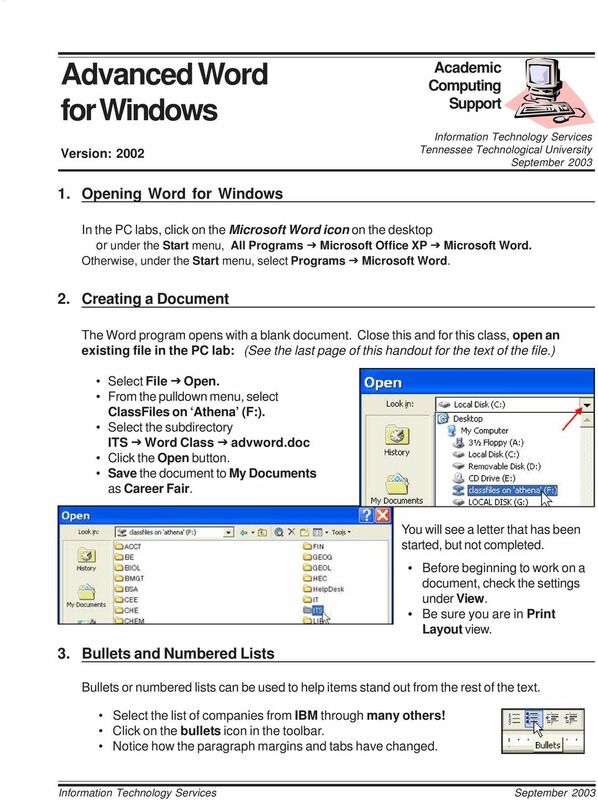 Download "Advanced Word for Windows"
1 Advanced Word for Windows Version: 2002 Academic Computing Support Information Technology Services Tennessee Technological University September Opening Word for Windows In the PC labs, click on the Microsoft Word icon on the desktop or under the Start menu, All Programs Microsoft Office XP Microsoft Word. Otherwise, under the Start menu, select Programs Microsoft Word. 2. Creating a Document The Word program opens with a blank document. Close this and for this class, open an existing file in the PC lab: (See the last page of this handout for the text of the file.) Select File Open. From the pulldown menu, select ClassFiles on Athena (F:). Select the subdirectory ITS Word Class advword.doc Click the Open button. Save the document to My Documents as Career Fair. 3. Bullets and Numbered Lists You will see a letter that has been started, but not completed. Before beginning to work on a document, check the settings under View. Be sure you are in Print Layout view. Bullets or numbered lists can be used to help items stand out from the rest of the text. Select the list of companies from IBM through many others! Click on the bullets icon in the toolbar. Notice how the paragraph margins and tabs have changed. 2 Advanced Word for Windows Page 2 3. Bullets and Numbered Lists (cont.) To choose the style of the bullets or numbers: Select the list of companies from IBM through many others! From the menu, select Format Bullets and Numbering or right-click anywhere is the list and select Bullets and Numbering from the pop-up menu. Select the Bulleted tab. Select the Arrowhead Bullet To increase the indent of the bulleted list: Click on the Increase Indent button in the toolbar. Note in the ruler, how the margin changes. 4. Adding Graphics Graphical images can add to the interest of your document. 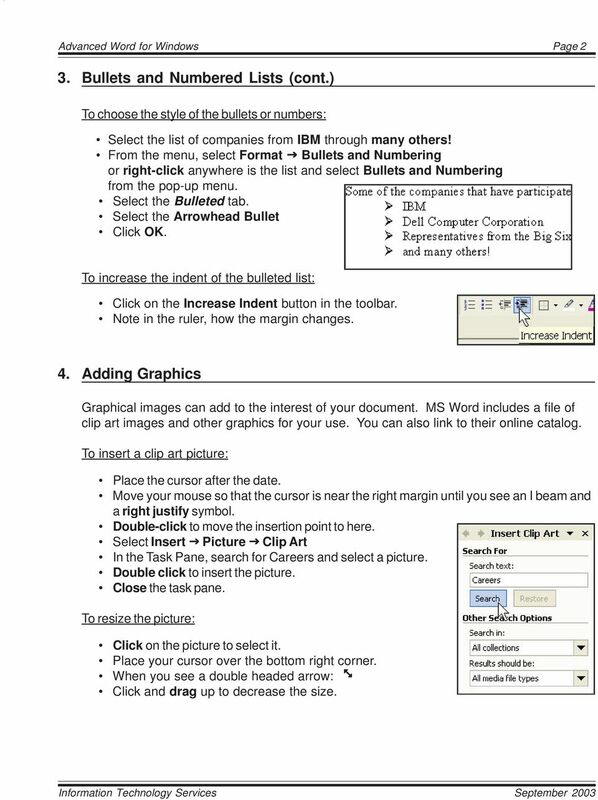 MS Word includes a file of clip art images and other graphics for your use. You can also link to their online catalog. To insert a clip art picture: Place the cursor after the date. Move your mouse so that the cursor is near the right margin until you see an I beam and a right justify symbol. Double-click to move the insertion point to here. Select Insert Picture Clip Art In the Task Pane, search for Careers and select a picture. Double click to insert the picture. Close the task pane. To resize the picture: Click on the picture to select it. Place your cursor over the bottom right corner. When you see a double headed arrow: Click and drag up to decrease the size. 3 Advanced Word for Windows Page 3 4. Adding Graphics (cont.) To resize the picture (cont. ): Or from the menu, select Format Picture Size tab Or right-click on the picture and select Format Picture from the floating menu and Size tab Set the Height and Width to 45% To format text wrapping around a graphic: Right-click on the picture and select Format Picture from the floating menu Select the Layout tab Select the Wrapping style Square Select Right under Horizontal Alignment. To frame an image: Select the Colors and Lines tab Under the Line section: select a color, style, & a weight as shown. 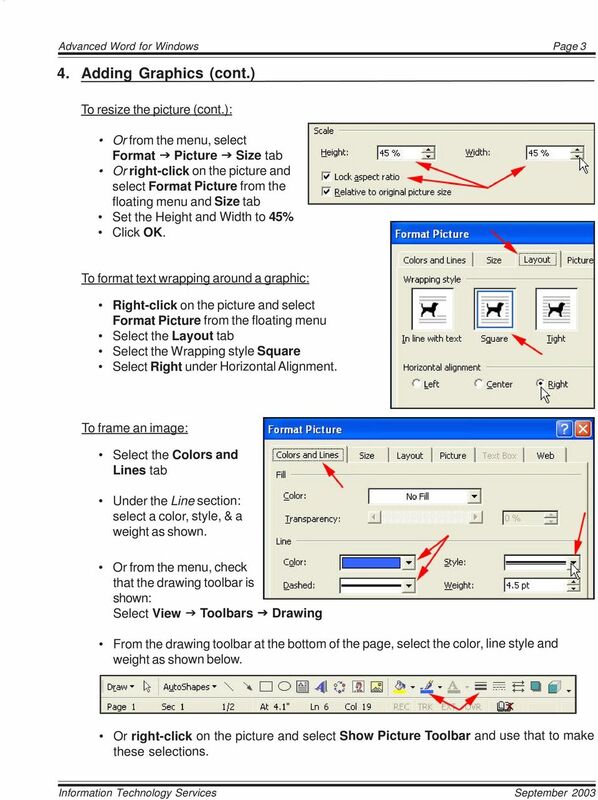 Or from the menu, check that the drawing toolbar is shown: Select View Toolbars Drawing From the drawing toolbar at the bottom of the page, select the color, line style and weight as shown below. Or right-click on the picture and select Show Picture Toolbar and use that to make these selections. 4 Advanced Word for Windows Page 4 5. Using Tables To present information in tabular form, you can insert a table into your Word document. 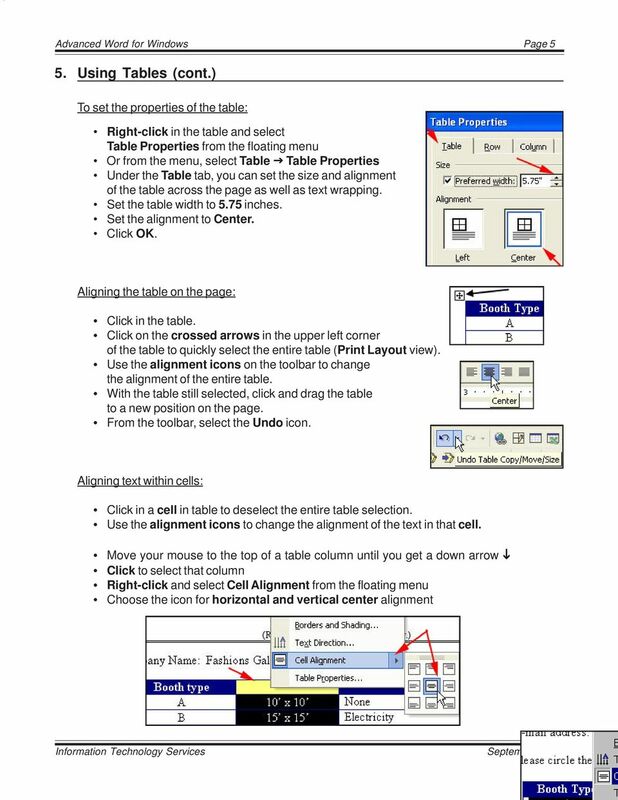 To insert a table: Move to the end of the letter by pressing Ctrl + End From the menu, select Table Insert Table. Set the number of rows and columns to 4. Do not click OK yet. Click on the Autoformat button. To set formatting for a table: Scroll through the list of Table styles to see what is available. For this exercise, select Grid 8. Note special formats for Heading row and First column. 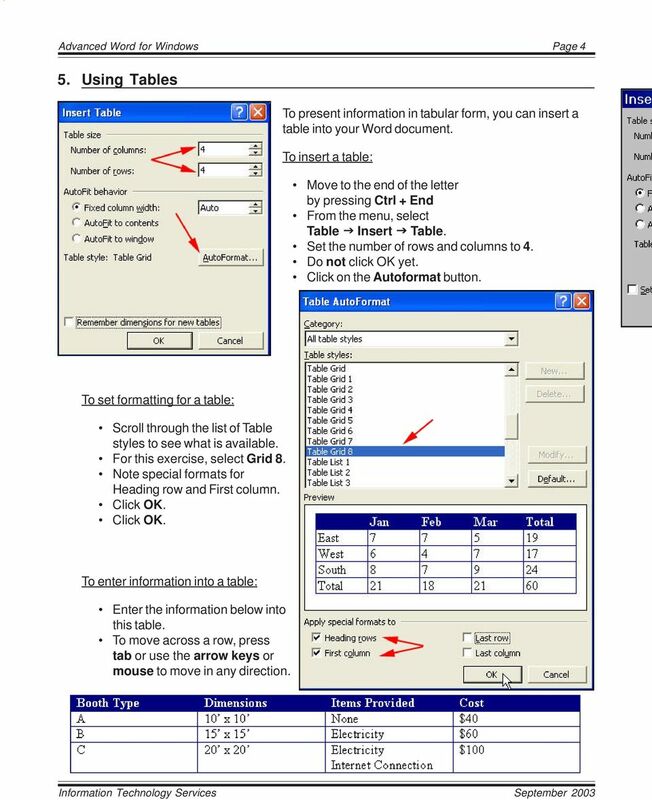 To enter information into a table: Enter the information below into this table. To move across a row, press tab or use the arrow keys or mouse to move in any direction. 6 Advanced Word for Windows Page 6 5. Using Tables (cont.) Sizing rows and columns: Mouse over your table and watch how your cursor changes. As you move over a row or column border you will get a double arrow Use this to adjust the width of one of your table columns. Click into a cell in column 1 of your table and right-click to select Table Properties from the floating menu. Click on the Column tab. Set the column width to 1 inch. Click on Next Column to select column 2. Set the column widths as shown below. Click on Next Column to move to each column. 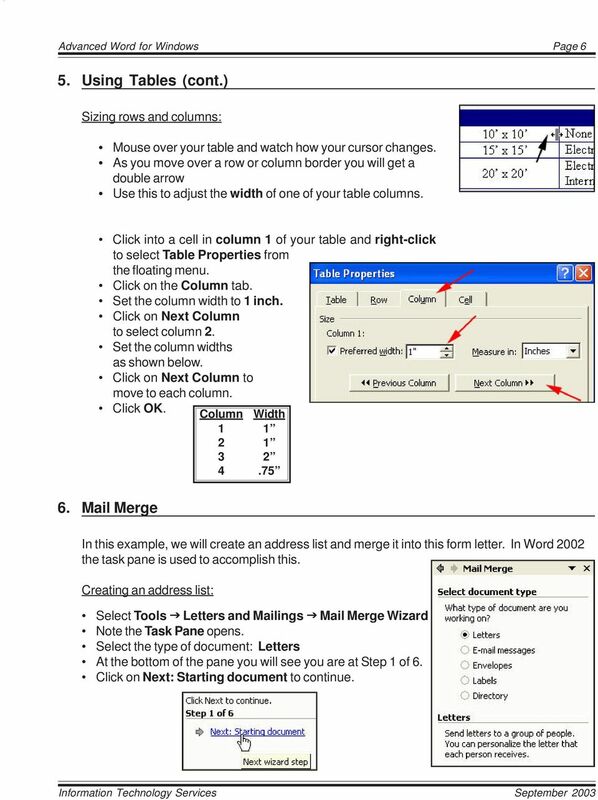 Column Width Mail Merge In this example, we will create an address list and merge it into this form letter. 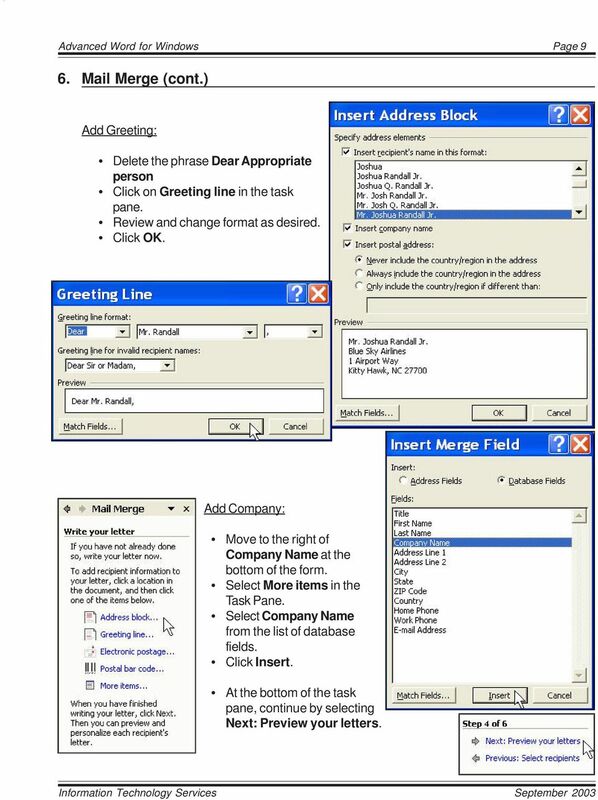 In Word 2002 the task pane is used to accomplish this. 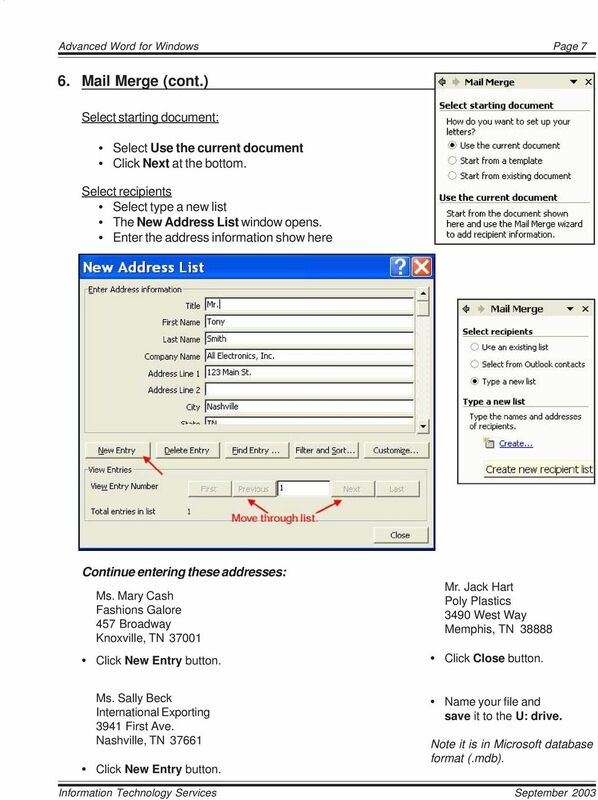 Creating an address list: Select Tools Letters and Mailings Mail Merge Wizard Note the Task Pane opens. Select the type of document: Letters At the bottom of the pane you will see you are at Step 1 of 6. Click on Next: Starting document to continue. 7 Advanced Word for Windows Page 7 6. 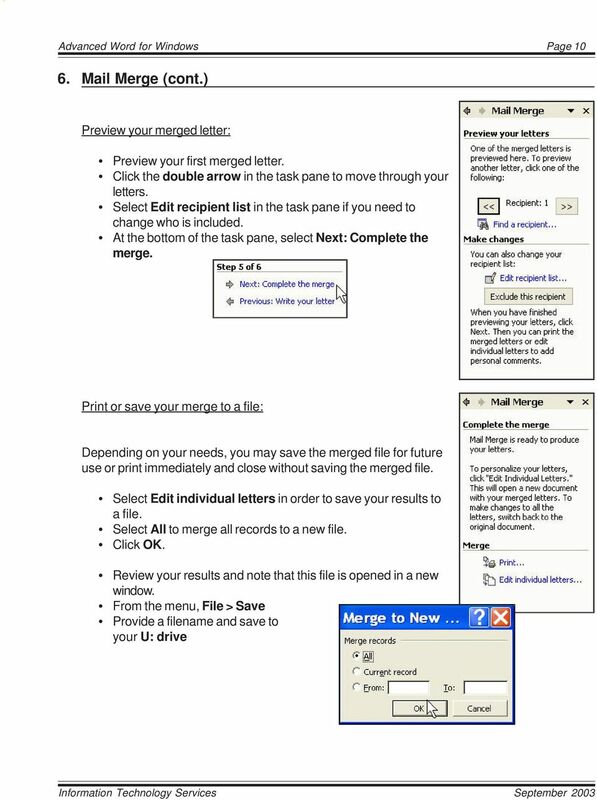 Mail Merge (cont.) Select starting document: Select Use the current document Click Next at the bottom. Select recipients Select type a new list The New Address List window opens. Enter the address information show here Continue entering these addresses: Ms. Mary Cash Fashions Galore 457 Broadway Knoxville, TN Click New Entry button. Mr. Jack Hart Poly Plastics 3490 West Way Memphis, TN Click Close button. Ms. Sally Beck International Exporting 3941 First Ave. Nashville, TN Click New Entry button. Name your file and save it to the U: drive. Note it is in Microsoft database format (.mdb). 8 Advanced Word for Windows Page 8 6. Mail Merge (cont.) View your data: To sort, click in the Last Name column heading or sort by company name by clicking in that column header. Select all your entries. Return to Task Pane: You are now returned to the task pane with Use an existing list selected and the file you just created, listed as the source of your information. 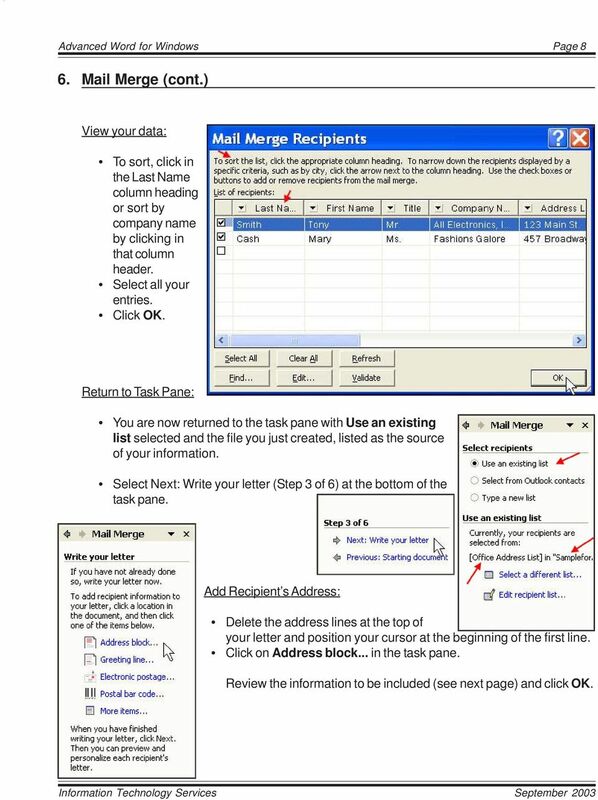 Select Next: Write your letter (Step 3 of 6) at the bottom of the task pane. Add Recipient s Address: Delete the address lines at the top of your letter and position your cursor at the beginning of the first line. Click on Address block... in the task pane. Review the information to be included (see next page) and click OK.
9 Advanced Word for Windows Page 9 6. Mail Merge (cont.) Add Greeting: Delete the phrase Dear Appropriate person Click on Greeting line in the task pane. Review and change format as desired. Add Company: Move to the right of Company Name at the bottom of the form. Select More items in the Task Pane. Select Company Name from the list of database fields. Click Insert. At the bottom of the task pane, continue by selecting Next: Preview your letters. 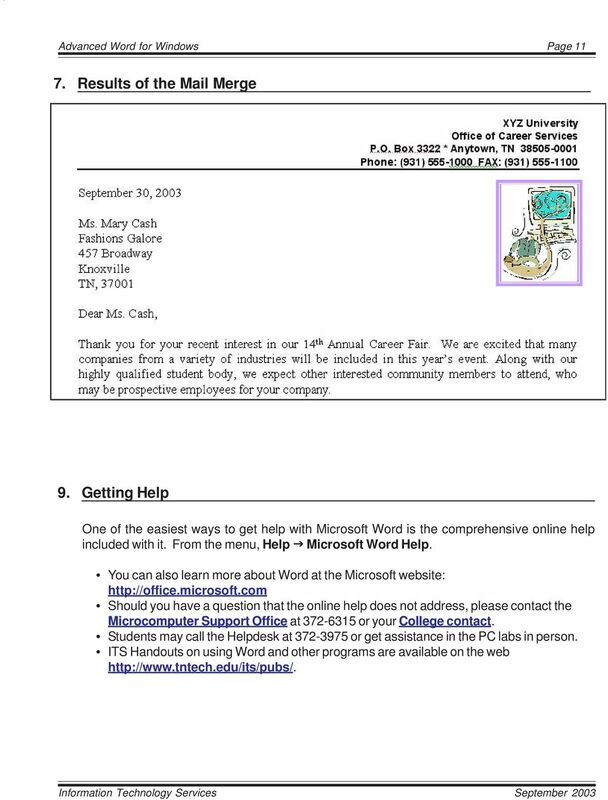 12 Advanced Word for Windows Page The Original Letter XYZ University Office of Career Services P.O. Box 3322 * Anytown, TN Phone: (931) FAX: (931) January 30, 2004 Company Name Contact Name Address City Dear Appropriate Person: Thank you for your recent interest in our 14 th Annual Career Fair. We are excited that many companies from a variety of industries will be included in this year s event. Along with our highly qualified student body, we expect other interested community members to attend, who may be prospective employees for your company. Some of the companies that have participated in recent years include: IBM Dell Computer Corporation Representatives from the Big Six Accounting Firms and many others! Because of the number of companies participating in our Career Fair, we do require a written confirmation of your attendance. Please complete and return the bottom portion of this letter with your payment by March 1, in order for us to make the necessary arrangements. We look forward to seeing you on March 25! 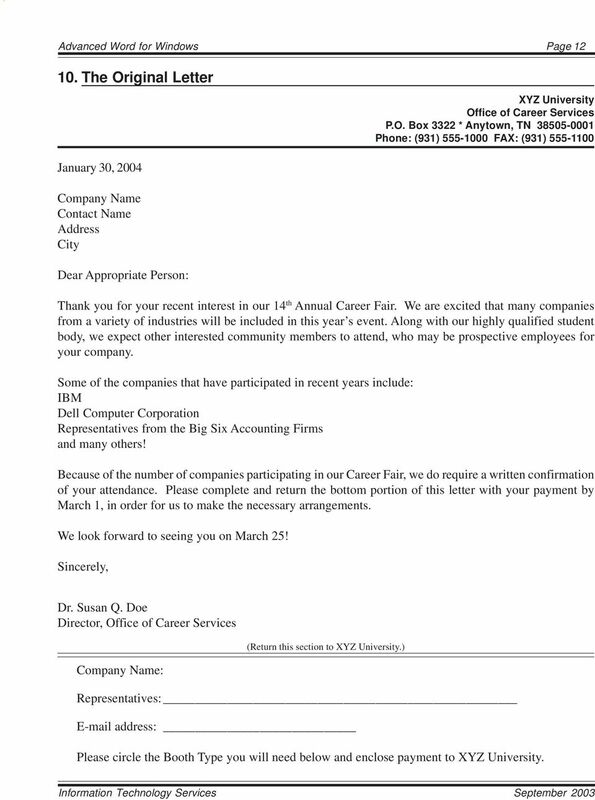 Sincerely, Dr. Susan Q. Doe Director, Office of Career Services Company Name: (Return this section to XYZ University.) Representatives: address: Please circle the Booth Type you will need below and enclose payment to XYZ University.